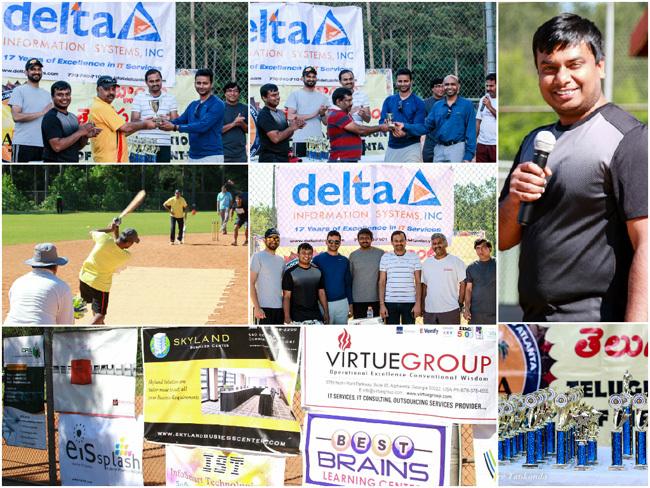 On a bright and sunny day, on the 23rd of May, 2015, TAMA conducted "Delta - TAMA" cricket tournament at the North Park in Alpharetta. 12 teams participated in the tournament which was successfully conducted under the leadership of Manoj Tatikonda, TAMA sports secretary. The day started with the teams being drawn into 4 leagues with each team playing with the other teams within the league. Weekend warriors participated with great gusto in the league phase. We saw highly competitive matches as well as some fun filled matches in this phase. All matches were 10 over per side with 9 participants on each side. We saw some big hits as well as some excellent bowling running and fielding. The semifinalists were selected based on the records in the league phase. Paramount GA Tigers and FutureTech Lions played the first semifinals between the winners of group 1 and group 2. This match was a nail biter and was won by Paramount GA Tigers with one ball to spare. In group 4 three teams were tied with 1 win each, the winner was picked based on the run rate. However the team with the highest run rate could not continue and hence the team from group 3 received a walkover in the semifinals. The final was held between Paramount GA Tigers and Serenity Kakatiya Broncos. Both the teams showed their dedication to the game fighting the bright sun in the high scoring final. Paramount GA Tigers dominated the most of the time in the finals and Serenity Kakatiya Kings were not able to keep the momentum they had in middle of their batting innings. The trophy was presented by Bharat Maddineni Vice President of Delta Information Systems to Paramount GA Tigers. Special thanks to Srinivas Vemulapalli and Srinivasa Duddempudi from Vibha for helping TAMA with cricket equipment. TAMA provided refreshments, hydration and lunch to all the participants in the event. Many volunteers helped out during the event. TAMA would like to thank Ramu Parupalii, Sharath Thadishetti, Srinivasulu Krishnappa, Jitesh Dundas, Vikas Sharma, Rajesh Thadikamalla, Swaminathan Annamalai, Venkata Ravi Kumar Pasupuleti and Bharath Maddineni who volunteered for the event. Audio was provided by DJ Dev. Photography covered by Kishore Tatikonda. Mahesh Pawar, Venkat Meesala, Vinay Maddineni, Devanand Kondur, Venkatapathi Raju Mandapati, Venkateswara Rao Gadde, Sri Harsha Yerneni and Nageswara Rao Doddaka from TAMA played a crucial role for making this event a great success.